This property is in a great location; close to the beach and with gorgeous views. We saw whales from the kitchen window 2 days in a row! We found it immaculately clean and very comfortable. It is well set up for dogs, with a secure yard and plenty of room for them to relax in the shade, or bask in the sun. We’re all looking forward to booking our next stay. We loved our mini break away, 3 wonderful relaxing nights. Everything at the property was more than we expected, excellent condition and clean. The view was beautiful & only a short walk to the beach. We can’t wait to book our next mini break. A lovely dog friendly property. Immaculately clean, very comfortable. Would thoroughly recommend. We had a wonderful weekend and the house is exceptional, the most comfortable bed I’ve ever slept in away from home. Ideal for taking your dog with a full fenced yard and nearby to lovely walking tracks. Beautiful views from the deck, living area and bedrooms..
Our 4 night stay was absolutely perfect in this wonderful accommodation. Every conceivale thing that we would need was supplied. Comfortable furniture & bedding. Views amazing & our doggies loved their freedom to come & go as they pleased. Hop, skip & jump & we were in a little cove totally protected from wind. Wouldn’t change a thing & met the hostess on day we were leaving & she is lovely!! 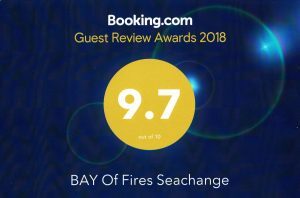 Would recommend this accommodation – lovely views, very well appointed, clean and comfortable with good access to the water through the reserve – we enjoyed the foreshore walks along the tracks. Great stay at a great house. Very gracious host and hostess. Great BBQ. The mtn bike was an unexpected blessing! This is a fabulous house which we could not fault. It was immaculately presented, super-comfortable and with terrific sea views and lovely coastal walks from the house. The owners were very attentive and have done an excellent job in setting up one of the nicest places we’ve stayed in. It even had wifi, which is uncommon in Tassie. We can highly recommend Seachange. Have stayed here twice now and will be back again later this year. I take my two border collies and they are made very welcome each time! Great place to stay – beautiful view of Skeleton Bay from kitchen and large deck, minutes walk to coves and the stunning Binalong Bay beach. Beautifully appointed and the most comfortable accommodation bed I have ever slept in! Jan and Rob are very helpful and superb hosts. If you have dogs and want a place to stay on the East Coast – don’t hesitate – book now! Unfortunately we only booked 1 night at this amazing property,. The view from the back deck was incredible. We travelled with another couple and there was more than enough room for another couple. The house has everything you would need to self cater for how ever long you stay. I would suggest stocking up on food etc in Hobart if travelling from there, we bought groceries at the IGA in Swansea and it was quite expensive. We had a great stay and would stay for a few more days next time. 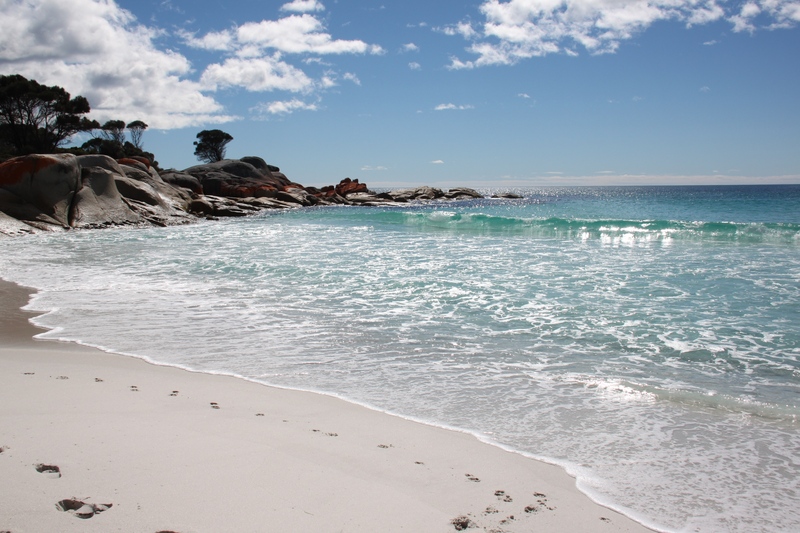 We really enjoyed our stay at Bay of Fires Seachange. The house had absolutely everything we needed and Jan was very accommodating. Will definitely stay again in the future. Beautiful sea view and surroundings, nice, tastefully decorated and practical house, big balcony, quiet area, in one word, great! We had a wonderful very short time at Seachange and wished we could stay longer. Certainly worth a long stay! What a great property, in particular the newly erected dog yard. It was wonderful to have our dogs safe and secure with the option of shutting the gates to separate them from the deck if needed. The house was very comfortable and well equipped with everything we needed. The size of the bathroom was awesome – it was so nice to have room to move!! Beautiful views, and nice and private. I would highly recommend this property and we will certainly be staying again in the future. We very much enjoyed our stay in Binalong Bay. The place was very clean and tidy and we loved your open living area. We stayed for only one night and were so happy to find the kitchen well-equipped for cooking. The communication with Jan was excellent. Thank you for allowing us to stay in your beautiful home. This stay was amazing. Clean,comfortable and had everything you could imagine for cooking etc. enjoyed so much I’m going back. We stayed at this gorgeous property when family members came over from the UK, so 2 couples and 1 single. We all stayed on the top floor and were very comfortable! The property is fully kitted out with everything you would need and the beds were very comfortable. Free wifi was an amazing benefit, after travelling around Tassie for a week without much signal. Cannot recommend the property enough and we even had a white bellied sea eagle great us upon our arrival. Totally enjoyed our stay nice quite surroundings lots of walks very comfortable house with everything that you could want for will be back again. Loved our weekend here, would highly recommend it. Beautiful location. The house was great, it had everything, and the most comfortable beds & pillows. Look forward to coming back again. Spacious accommodation – clean, bright, new house that had everything we could have needed. The kids loved the colorful bean bags, i loved the water views and the large deck and my husband was impressed with the in-wall usb chargers. There was high chair and cot for the baby. Beach was an easy (fun) walk down a path. My children suggested that we ‘live here.’ All are looking forward to returning. We loved this property in Binalong Bay, owners were easy to deal with and the property itself was spotlessly clean with everything you could possibly want. 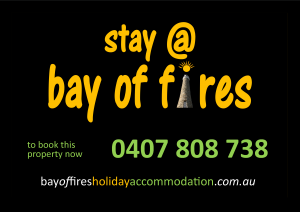 Great location near Bay of Fires and short drive to St Helens. We dined at Moresco Restaurant on recommendation and it was excellent. Highly recommend. Great, would come back again! Absolutely loved this place. It has everything you need including food bowls and a towels for your furry family members. Great location, just a short walk to the beach. Awesome in every aspect !! Well appointed house and fantastic views. This property took us by surprise! We did not want to leave. Nor did our Charlie(our dog)(baby).She wanted to play with the rabbits. Our hosts were warm and welcoming as is the house .Very ,very tastefully finished. We will be back! Spotlessly clean with a beach house feeling, even though it’s not on the beach – the living room/kitchen and the huge deck look over the tops of the trees on the adjacent reserve to a view of the sea breaking on the lichen-covered rocks. Fabulous. Everything was comfortable and high quality, from the beds to the coffee for the espresso machine. We felt right at home and so did our small dog (and she’s a tough critic). With the three bedrooms upstairs plus the downstairs unit as well, it would be great for a family / group holiday, especially as you can bring the pets. The nearby restaurant was also great. Highly recommended. Stunning house, stunning view, lovely friendly owners …… highly recommended. Won’t disappoint. Rob and Jan, the hosts with the most! We only booked at the last minute. What a super find. Open the front door and wow – sea views greet you. The view is far better than what you see on the website! The house is extremely clean, light and airy, and has the comfiest of beds with superior quality linen. The large deck is just the place to sit back and enjoy a lazy afternoon with views across the bush to Skeleton Bay, the start of the Bay of Fires. It was easy to explore the walks, secluded little beaches and rock pools which are just 50m or so from the deck. The house is only a short walk to the main beaches and Moresco Restaurant. The owners were really helpful, and happy to give you local hints for what to see and do in the area. We just wish we could have stayed longer! We will be back!! Exceeded expectations in terms of location, cleanliness, facilities and quality of linen. Perfect for access to spectacular beaches and touring the North East coast. Delicious seafood to be had. Grateful to be able stay in a very high quality, pet welcome, holiday house. We loved our stay at Seachange. From the enquiry about availability through to payment we found all correspondence with the owners were easy and prompt. Amazing views from the deck, not only the ocean but wildlife and birds in abundance. There were plenty of parking and even space for the boat. Everything was perfectly laid out and clean. We highly recommend this property and we will definitely stay here again. This was the best, most equipped Holiday Rental we have stayed in. Plenty of off street parking, room for a boat. Pet friendly with a secure deck for animals and children. Beautiful outlook with ocean views and bush reserve in front of house . All furniture and bedding was comfortable. It had all the creature comforts of home. Would recommend and stay again.